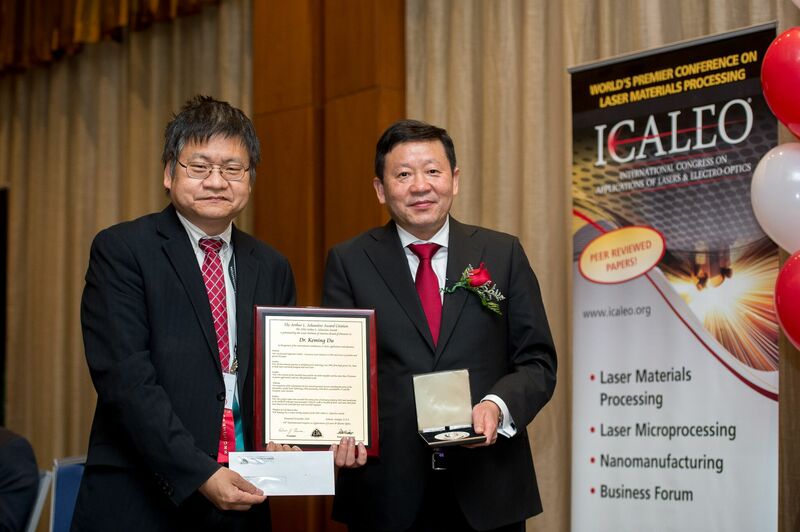 At the 34th International Congress on Applications of Lasers & Electro-Optics (ICALEO) on October 21, 2015 Dr. Keming Du was awarded the Arthur L. Schawlow Award in recognition of his outstanding contributions to the field of industrial laser technology. With more than 70 patents and more than 100 publications Dr. Keming Du is a pioneer of industrial laser technology. The generation and amplification of laser pulses in compact diode pumped systems are a central part of his work. He is the inventor of the InnoSlab lasers and amplifiers and spearheaded the development of the InnoSlab-Technology for solid-state lasers and has hold records regarding the amplification of short and ultrashort pulses up to kW powers. From 1985 to 2001 Du worked at the Fraunhofer Institute for Laser Technology on the development of high-power lasers. In 2001 he founded EdgeWave GmbH to offer innovative solutions in compact diode-pumped solid-state lasers for different applications. In 2010 Du and EdgeWave’s team has received the 1st prize of the “Innovation Award Laser Technology” from Arbeitskreis Lasertechnik e.V. and the European Laser Institute. Under Du’s leadership, EdgeWave was awarded the Stiftverband’s Science Award 2012 together with several partners from science and industry. In the same year EdgeWave and its project partners received the 1st prize of the „Innovation Award Laser Technology“ from Arbeitskreis Lasertechnik e.V. and the European Laser Institute, as well as the Berthold Leibinger Innovation award. The Arthur L. Schawlow ist he most important and recognized prize in the area of laser technology. It has been awarded by the Laser Institute of America since 1982, in recognition of individuals whose life’s work advanced the fundamental understanding of light-matter interaction. Past recipients have included not only Nobel laureates Arthur L. Schawlow, Theodor Hänsch and Steven Chu, but also distinguished representatives of the industry such as Berthold Leibinger (Trumpf) and Valentin Gapontsev (IPG Photonics). For the longest time the use of short-pulse lasers has only been feasible for scientific purposes due to their complex construction. The InnoSlab-Technology first enabled robust laser systems with high average and peak powers for industrial applications. Those lasers are suited for cutting of a very different materials as well as precision processing of tools. In addition many laser systems used in research benefit from the particularly high pulse energies of an InnoSlab amplifier.